People claim their tweets criticizing United Airlines were 'deleted' by Twitter. By now it seems like literally everyone is talking or tweeting or making memes about United Airlines, after a video of a passenger being forcibly dragged off a flight went viral earlier this week. And now there's a weird conspiracy theory circulating in the Twittersphere that Twitter is helping the airline cover up the scandal, by deleting people's tweets, the Independent reports. The rumor started when a handful of Twitter users claimed that their tweets had mysteriously "disappeared." 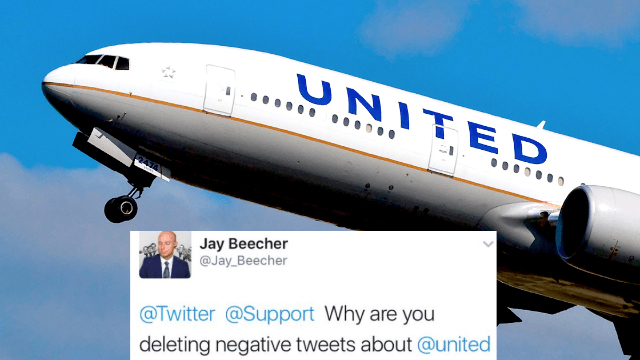 "Very strange- twitter seem to be deleting negative tweets about @united Airlines, including mine..." wrote conservative author Jay Beecher on Monday. He then reposted his tweet, claiming the social networking site has joined forces with United to "suppress the justified negativity." He's not the only one to make this claim. Same thing's happened to me twice this morning. Thanks for reporting on it. Mmmm. Who is doing the deleting? @Twitter or United? Same thing happened to me. Tweet deleted; question about tweet having been deleted was ... deleted. Funny... I tweeted @united earlier today to ask about my flight next week and the tweet is deleted. Begging to regret booking with them. If true, this would be VERY bizarre, given that United has been trending on Twitter all week, and millions of people are continuing to tweet about the scandal with no problems. So if Twitter really IS colluding with United Airlines to "protect the brand" as some people seem to believe, the question is: why have they not taken down any of these hilarious gems? Is it because even these alleged Twitter scammers have a soft spot for a great joke?